I love to craft and have delved into many things over the years: cake decorating, painting, embroidery, knitting, ceramics, porcelain painting ..... and I've found some of the techniques transfer very helpfully to cardmaking. At this point I'm wondering why I never tried paper tole! 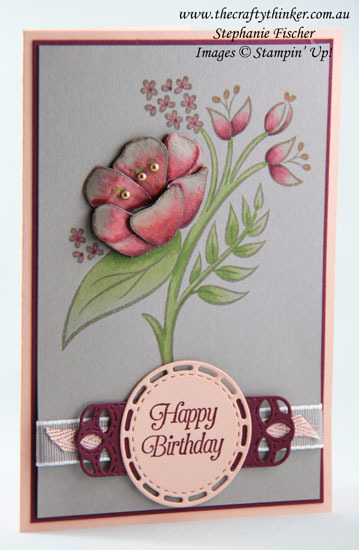 I have absolutely no idea how to do paper tole - which is quite apparent - but I still quite like my finished card. I stamped the image onto Gray Granite card with Gray Granite ink and then stamped the flower several more times onto a strip of Gray Granite card. 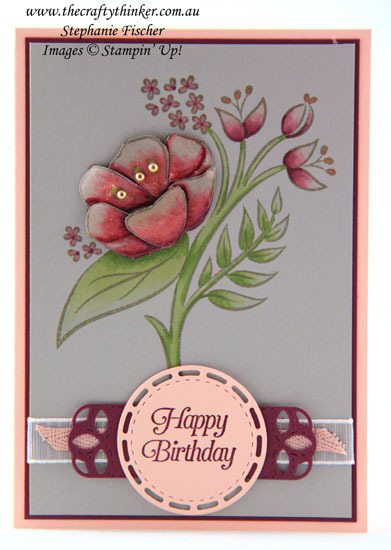 I coloured the images with Stampin' Blends Alcohol Markers - both on the card front and on the separate strip. Each of the flowers on the strip yielded only one or two petals because I cut them to ease overlapping and gluing. After cutting them out and lightly curling with the help of a bone folder, I applied a shiny layer to the individual petals with a Fine Tip Glue Pen because I wanted to give them a bit more substance.